RearGuard - A Summer Essential! RearGuard can be described as the last line of defence against flystrike, that awful condition where maggot actually eat the flesh of a living animal. The animal will suffer a great deal of pain, risk serious infection, and often die from shock. Flystrike can affect any rabbit, whether clean and healthy or not - and eggs can be laid in a few seconds then hatch only a few hours later. And don't forget that houserabbits are just as at risk as outdoor rabbits! Those at greatest risk are those living in unsanitary conditions, the elderly or infirm or those with gastric or urinary issues; a mucky bum will attract flies in minutes. So How does RearGuard work? RearGuard does not actually repel flies but it stops any maggots from forming and damaging the animal; the eggs are prevented from developing into maggots.The fly species that does this dirty deed is the common blowfly Lucilia sericata, also known as the Green Bottle fly due to its shiny greeny black back. And if you're not yet grossed out, this is the same species used in the medical sector for wound cleaning...blowfly are extremely good at munching rotting or diseased flesh. And How is RearGuard used? Rabbits should be ideally first treated in early summer before any flies are seen, and then treated at 8-10 week intervals under conditions of repeated blowfly challenge. If the rabbit is continually attractive to flies, this may be due to an underlying disease e.g. diarrhoea or incontinence, or a lack of hygiene within its housing. In such cases further advice should be sought from your veterinary surgeon. Rearguard comes supplied ready-to-use in a bottle with built-in applicator sponge. Gently depress the sponge to break the valve before applying. Then apply the product using the sponge applicator, ensuring that the rabbit fur is thoroughly wetted with the solution from the middle of the back to the tip of the tail. Ensure that the entire bottle is applied. Special attention should be paid to the areas under the tail and between the back legs. Treated rabbits may show a temporary reduction in appetite in the 24-48 hours following treatment. 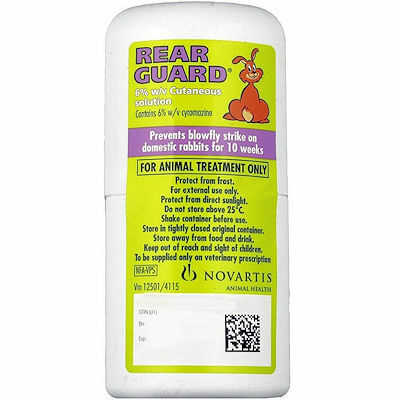 RearGuard is not to be used in pregnant or breeding females or those under 10 weeks of age. RearGuard should not be applied to broken skin or allowed to run off the animal. Discard any unused product after application. For external use only. For animal treatment only. Wash hands and exposed skin after use. 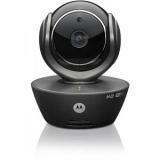 Wash splashes from skin and eyes immediately. Do not smoke whilst using this product. Care should be taken in the treatment of old, sick or debilitated rabbits, and we recommend speaking with your vet in such cases or if you have any concerns about the use, suitability or application of RearGuard. Can Anything Else Help to Prevent Flystrike? Yes, although note that RearGuard is the ONLY suitable and licensed product for use on rabbits for the prevention of flystrike. Other things any owner can do to help prevent flystrike is to firstly ensure their rabbits are healthy, with a good hay rich diet (for optimal digestion), ensure any digestive health issues or dirty bottoms are addressed with a rabbit experienced vet as a matter of urgency, and add flyscreens and other fly deterrents (such as fly zappers) to the accommodation - care must be taken to ensure wires or screens are out of the reach of tiny teeth (remember rabbits can stretch quite some distance!). We do not recommend use of sprays or other chemicals, though some natural fly deterrents may be appropriate, and plants such as eucalyptus, lavender, peppermint and citronella are all thought to help too. But remember, RearGuard is the only way to stop maggots from forming if a fly gets through other defences! Help! I Think My Rabbit Has Flystrike. What Do I Do?? Firstly do NOT wash the affected area as this makes it harder for the maggots/eggs to be located and removed. Second, phone the vet to advise you're coming in with an emergency. Then pick off all those eggs/maggots you can see using tweezers (if possible) to reduce any further injury and get your rabbit to the vet asap. In addition to pain relief, your rabbit will need much therapy and care once all the maggots and eggs have been removed (fur may be shaved to help with this), and may be hospitalised to help prevent against shock. Veterinary intervention must be sought if flystrike is found or suspected - your little ones' life may depend on it. A Quick Note About The Supply of RearGuard. As a regulated veterinary medicine, RearGuard can only be prescribed and supplied by a suitably qualified person (SQP) or a licenced veterinarian. We have an SQP on The Hay Experts team so we are allowed to prescribed and supply this medicine via the internet or phone to you. During the purchase process of RearGuard, you will be asked a number of questions which will help our SQP determine the suitability of RearGuard for your little ones' particular situation - we have to ensure it is appropriate for need and be used correctly. You will also be given the opportunity to request a call back or speak with our SQP to answer any questions you may have on RearGuard; we are here to help and want to ensure you have everything you need to ensure your little ones are protected. Just drop us a line or give us a call if you have ANY queries!